Governor Nixon has vetoed a legislative resolution that would block a wage increase for home health care attendants. Some legislators didn’t like that the Department of Health and Senior Services made a change in its rules to increase pay for those attendants from 7.65 to between 8.50 and 10.15 an hour. Those lawmakers said the Department can’t make that change and that it’s up to legislature to approve a pay increase. The resolution passed with enough votes to overturn Nixon’s veto, and an override attempt seems likely. House Speaker Todd Richardson (R-Poplar Bluff) said the legislature’s issue was not with those attendants getting paid more. “What this resolution is about is about the appropriate structure of government and the appropriate role for the legislative and executive branches. It’s about nothing more,” said Richardson during debate of the resolution. Democrats including Gina Mitten (St. Louis) said attendants won’t understand those kinds of issues, but would understand that they would not get the boost in pay they’d hoped for. She said the rule change should be allowed to stand. “What we’re really talking about are a group of workers that are very low paid who have the right to bargain and the deck in our statutes is completely stacked against them,” said Mitten. 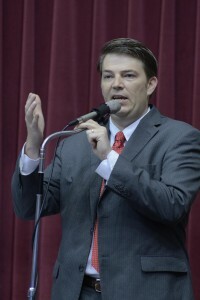 Representative Jon Carpenter (D-Gladstone) urged Republicans to have a debate about policy that could result in a wage increase for those attendants. “I’d be all about voting yes on this as long as we had companion legislation that addressed, from our perspective, a way to get these folks a raise,” said Carpenter.